Besides being one of the wealthier neighborhoods in Denver, it is also one of the most beautiful neighborhoods with a couple of parks, golf courses, and plenty of running and walking trails throughout the cascading grass areas. The neighborhood is right down the street from many museums, the Denver Zoo, and the Denver Botanic Gardens. Located in an area that is easy to get to, Hilltop offers the chance to live close to downtown Denver without the hubbub of city living. The neighborhood is bordered on the west side by Colorado Boulevard, on the south by Alameda Avenue, on the north by Severn Avenue, and runs along 6th Avenue to Quebec Street. The name Hilltop was given to the neighborhood because it’s higher in elevation than the surrounding areas. Directly in the center of the neighborhood you can find Cranmer Park and enjoy an incredible view of the Front Range. The development of the neighborhood in the 1940’s and 1950’s centered on the presence of water branching off the Highline Canal and the streetcars then running along 8th Ave and Quebec. Many of the original houses are still standing today, giving Hilltop its characteristic charm. If you’ve ever driven east of Colorado Blvd on 6th Ave in Denver, you’ve probably admired the tree-lined streets with beautiful houses and lush green yards. 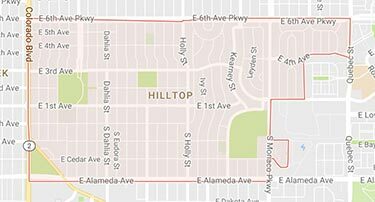 One of Denver’s higher-end neighborhoods, Hilltop is side-by-side with the Crestmoor neighborhood. With a community full of architectural charm and diversity, this neighborhood is full of large lots, stunning yards and plenty of trees. The house styles range anywhere from English Tudors to 2-story colonials and Georgians as well as many custom made luxury homes. If you take a drive through the neighborhood these days you will see many lots being bought and re-developed for new custom made homes. 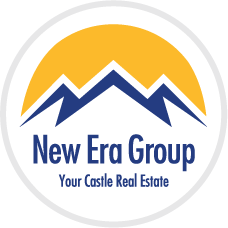 If you think this neighborhood might fit your wants and needs, give us a call at New Era today and let one of our highly trained agents take you on a tour of the neighborhood.